I really don't know what to say about these waffles except... well.... you really should make them this weekend. They are pretty much the best waffles I've ever had. You all know I'm a big fan of the sweet and savory combo, so it should come as no surprise that these were such a favorite. Thick slices of applewood smoked bacon are cooked with brown sugar, then broken into bite-sized pieces (try not to just gobble the bacon up at this point). It is then mixed into a waffle batter that is made with brown-sugar instead of granulated, and just a touch of cinnamon. 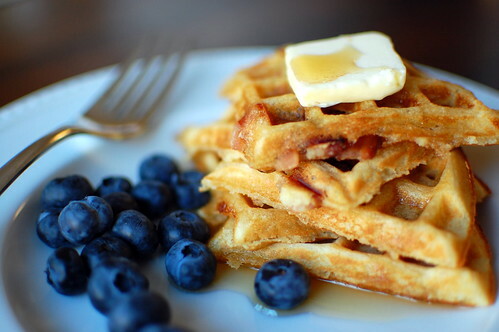 Drizzle the finished product with some pure maple syrup, and eat with some fresh berries. You have the perfect breakfast. Preheat the oven to 375. Spray a baking sheet with cooking spray, and line with foil. Spray the foil with cooking spray, and line the bacon in a single layer on the foil. Sprinkle each slice with brown sugar. Bake until the bacon is crispy, and the sugar is caramelized, about 10-15 minutes. Immediately transfer the bacon to a cutting board, and when cooled enough to handle, break into bite-sized pieces. Set aside. Set your waffle iron a clean level surface, and set to preheat. Whisk together the flour, baking powder, baking soda, salt, cinnamon, and brown sugar together in a large bowl. In a medium bowl, whisk together the oil, eggs, vanilla extract, and buttermilk. Make a well in the center of the dry ingredients, and fold in the wet ingredients. Stir until just combined (its okay to still be lumpy). Gently fold in the bacon, being careful not to overmix. Cook in the waffle maker according to manufacturer's instructions. I am sitting at my desk at work and I want to eat my screen..yum! I wish I had a waffle maker!! These sound soooo good! 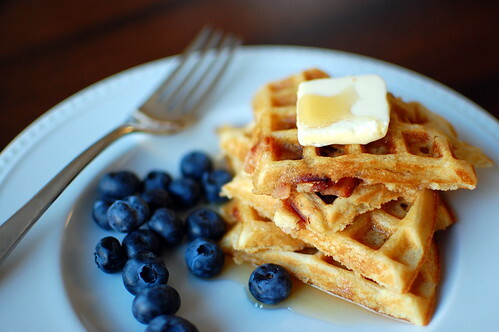 What a delicious recipe, I love to have waffles for breakfast, specially when they are as well prepare as this.